I haven’t been able to blog for a couple of weeks due to an unusually heavy work/travel load, and an unusually large response to a recent post. Every once in a while I will write something that I believe is a “no-brainer” — it’s not overly profound or insightful, but it catches people’s attention and imagination and it snowballs. Such is the situation with prayer. I made the simple observation — that I have made a number of times before — that United Methodists, by and large, have very shallow and perfunctory prayer lives, and the main reason for this is that they aren’t being taught to pray. The response has been an avalanche (by my standards) of emails, letters, phone calls and personal conversations from people wanting to talk about prayer — mostly to agree with me, then share their own story. I am in my seventh year of my first church (she isn’t UM) and I never thought about teaching prayer until I read your blog. I realized, ‘No one ever taught me to pray — not at home, not in church, not in college, not at seminary. It has always been assumed that since I am a Christian, I pray.’ I took your blog to my women’s study group and to my ecumenical clergy council and we started discussing it. Most of the pastors there said they can’t remember being taught to pray, except a few remember their mothers teaching them simple prayers and table graces as children. The priests were taught at Catholic school, but even they talk about learning much by rote. One Lutheran pastor also says he remembers the parts of the catechism on prayer, but nothing was ever really explained. My question is, how did we get here? Almost everyone agrees that prayer is very important — essential, in fact — but none of us are doing much about it. That’s going to change, however. Our ecumenical council is going to focus on prayer for 2011 and our shared programs for teaching and preaching will all focus on prayer all year. Thank you for planting the seeds! I went to the preacher and asked him straight out if prayer is important. He said ‘yes.’ This is a little confusing to me. We really don’t talk about prayer and we don’t pray that much in church. I come from a family that was not religious. My mom’s family is Jewish, but we never celebrated any of the holidays except Hanukkah and Christmas — and I am embarrassed to confess that I never realized either one was especially a religious holiday. They were both about getting stuff. We never said prayers before we ate or when we went to bed. I have been to churches where prayers are written in the bulletin and where the preachers prayed for us, but I actually do not remember anyone ever telling me that I was supposed to pray or how to pray. Somehow what we do in church seems very phony. 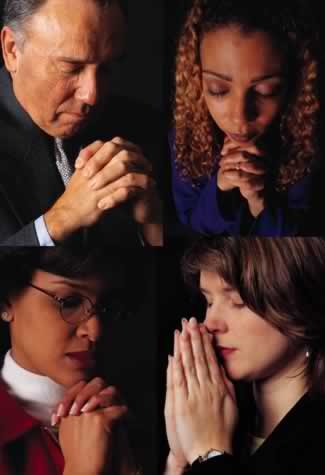 I mean, I’m not praying; I’m just saying what somebody tells me to. Some of my friends think I’m stupid because everybody knows that you’re supposed to pray. I didn’t. are there rules for prayer? how will I know if I am doing it right? I’ve seen people bow their heads and close their eyes and clasp their hands and I’ve seen people raise their faces with their eyes open and their arms up and hands spread. Which is the best way? Are these for different kinds of prayers? how much time should I pray? are longer prayers better than shorter prayers? can I pray while I am doing other things? can I pray while I drive? That would save me a lot of time and maybe I would have time to pray then. can I pray by myself? will I annoy God if I don’t do it right? is there a best time to pray? do I have to go to the church to pray? is it alright to pray with other people/a friend? should I try to get my husband to pray, too? should my kids pray or can I pray for them? how do I know that God will hear my prayers? am I supposed to learn special words or a language to pray? if I pray for something once should I pray for it again, or is once all God needs to know what I mean? what if I pray for something and other people are praying for the opposite? I don’t feel holy enough/good enough/worthy to pray. I feel embarrassed to pray. I don’t know enough to pray. how can God hear my prayer when millions of other people are praying at the same time? how long should I wait for my prayers to be answered? And on and on and on. Dozens of questions like these, and one reason I haven’t been blogging is that I have attempted to answer each and every heartfelt, sincere letter from people who are not being taught, encouraged or supported to pray in their local church. How weird that people would write to a perfect stranger (well, nobody’s perfect…) rather than ask their own pastor or priest. Or maybe it isn’t so weird. Many people preface their question by confessing that they are embarrassed to even have to ask. They are mortified to think they might not know something “everyone” else knows. What is interesting is that people aren’t asking deeply theological questions. Most are about praxis. Many about understanding the process. But all of them very real and very important — and questions that no long-time church member should still have. I don’t fault the people asking the questions. I think the responsibility lies within the institution charged with providing spiritual guidance and faith formation. How can we make it through seminary without understanding the centrality of prayer to our faith tradition? How can we affirm and ordain leaders who do not understand the foundational place of prayer in the Christian life and community? How can we educate children, confirm youth, and develop adult disciples with no clear comprehension and practice or prayer? Before we offer another small group study, hold another church supper, host another mission trip, or lead another new member class, perhaps we should step back and reconnect to the most basic of basics. Lord, teach us to pray. Wow, Dan! When you shake up the church, dust and detritus rain down from the rafters into the nave. First it’s “What is the church?”, then it’s “What is the church for?”, followed by “How are we faithful to our vows?” Now it’s “How should we pray?” I suppose soon it will be “What is the Bible?” 😉 Keep it up. The rafters need cleaning, anyway. I guess I was really fortunate, because when I was at Duke Divinity School, John Westerhoff taught a course titled “Pastor As Spiritual Guide” — in large part a course about teaching people to pray. Of course, preparing to teach people to pray also required us to learn a lot more about prayer than most of us had known before. That course may have been one of the most important that I had over those three years. Good to see you back on the blog………..
BRAVO on another spot-on bit of wordsmithing. I say lets keep shakin’ those “rafters”. Also, I’ve found that if you don’t have questions about prayer, then you’re not praying enough! To read more prayers simply google “Prayerlogue”. Oh, and feel free to use any of them.